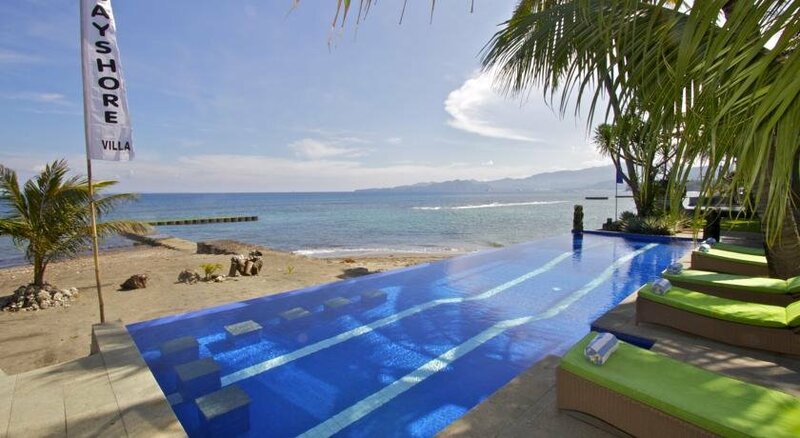 Bayshore Villas Candidasa is tucked away from the hustle that is #South Bali. The Beachfront villas, feature a mix of modern architecture and traditional Balinese, presenting a stylish setting for your perfect holiday. The 6 world class villas all offer a stunning view of the sea and a cooling breeze. All villas have air conditioning, ceiling fans, a safety deposit box and elegant garden bathrooms with steaming hot water. Bayshore also offers 2 private residences, furnished with luxury finishes, with breathtaking views from the terraces of the crystal clear water of the Lombok Straits, #Nusa Penida and #Nusa Lembongan with their flotilla of sea craft. You will be delighted by a meal in our idyllic Oceanside Terrace Restaurant viewing the spectacular sunset over the ocean. With our trained personnel we strive to offer you the best service possible. Just 10 minutes away you can explore Bali's village life in Tenganan, home to the ancestral Bali Aga. Don't leave without one of the famous double ikat gerengsing sarongs. Visit the historic water-temples of #Tirtagangga and the newly restored Ujung water palace and take a dip into the holy waters.